My mind keeps going to parallels between the worlds of Brexit and Trump and what happened in Germany in the 1930s. It’s a worrying parallel. At the time of the referendum on the UK’s membership of the EU, I was in Spain at the annual meeting of the Intern­ational Society for Psycho­analytic Study of Organisations. A gathering of people from across the world who are used to exploring unconscious processes was a rich context in which to explore what was going on under the surface. By coincidence, on polling day one conference session was intended to focus on ethical dilemmas. We were shown short films on two famous psychological experiments, the Milgram experiment and the Stanford experiment which are controversial both because people were harmed, and because they shed light on how civilised people can come to behave badly. They have been used to understand what happened in the concentration camps, but are much more widely applicable than that. The ensuing discussion seemed a little dry, as if there was something important which was being avoided. I took the microphone and made a link with some of the violence of the referendum: the murder of Jo Cox, an incident in a supermarket where someone I had seen earlier in a Vote Leave stall was shouting at a cashier planning to vote Remain, and some very aggressive comments from Leave supporters in door-knocking in the campaign. This is not to accuse Vote Leave of orchestrating violence, but it suggests something was being mobilised (which has become more obvious since then). I commented on the dark streak in Europe: along with our capacity to be civilised, there is a capacity to behave in very destructive ways. I expressed my fear that this was close to the surface in the referendum and struggled with tears as I commented on the way the EU has been set up to contain that destructive streak in the European psyche, and the fears evoked by some in the UK wanting to pull away from that. I was met with a round of applause. The tears were relevant: a sense of connecting with something raw in me, and shared by others in the room. Over the next few days others made connections with Donald Trump in the USA, and right-wing movements in France, Hungary and Poland, and the treatment of boat people in Australia. The sense was of pressure in the system getting released along a familiar fault-line between the UK and the EU. From a British perspective, there is the convenient fantasy that we won the war and defeated the Nazis. But we have much more in common with Germany than that. We invented concentration camps, had our own anti-semitism, and Oswald Mosley’s “Black Shirts” invite comparison with the Nazis. It is tantalisingly easy to project the unacceptable side of ourselves onto the Germans, and grossly mistaken. I find myself thinking of Germany in the 1930s. The economic hardship of the last few years is not as extreme as that of the Weimar Republic, but it is deeper than people recognise: I suggest that the very invisibility is fueling resentment. This is not to dismiss Brexiteers as fascist. It is to say that real pain lay behind people voting for the Nazis, and there is real pain in some of those voting for Brexit. In Mein Kampf, Hitler says propaganda is aimed “only to a limited degree at the so-called intellect… The art of propaganda lies in understanding the emotional needs of the great masses and finding a psychologically-correct form, which is the way to affect them”. The parallel with comments from the Leave campaign is chilling. I hesitate to use the word “lies”: the things said caught people’s emotional reality, but were not much to do with the EU. Against this, I can see why the EU would be unpopular. Founded to contain that extremist tendency, it moves slowly and wisely, by consensus rather than conflict. It’s the opposite of what Hitler was advocating, and might miss that (dangerous) and primitive appeal to collective anxiety. 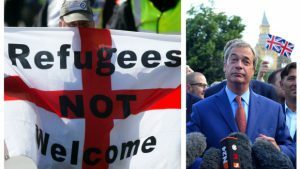 Incidents of racist abuse and xenophobia since the referendum underscore the parallel with the 1930s. But dismissing people as evil is too easy and misses the collective pain that is around. Like those in Germany then who were horrified at how things were going, there is a clarion call to Liberals to pull in a different direction — working with our European partners to find a shared solution to our shared problem today.